"Very professional and well-represented, excellent informational package on the product and the company." Very professional and well-represented, excellent informational package on the product and the company. Andrew Gagliairdi was very personable and professional. The presentation was informative and I had no questions about the process after the presentation was completed. The Insulation Team worked very well together. We received one of your flyers in the mail the day after I decided something needed to be done about the problem. More importantly was the representation given by Mr. Gagliaird. Very satisfied! Andy was excellent, highly qualified, receptive and knowledgeable. Arturo, Omar and the rest of the crew were friendly and hard working. They were very receptive to my concerns. I hired Quality 1st because of reliability, throughout appointment telephone calls at every stage of process starting with Andy. They followed up and followed through. Extremely satisfied with PolyLEVEL of our exterior shop. Andrew was amiable and through. We understood exactly what he was getting, the cost and the PolyLEVEL advantages. William and Sebastian were friendly, professional and very conscientious. William took care that the PolyLEVEL would not breach our foundation & seep into the basement. The team worked well and left everything clean, sealed and pitched properly. Great Workers ! PolyLEVEL seemed superior to mud jacking in many aspects for our sunken stoop. Quality 1st positive reviews & endorsements from BBB and Angies list gave us confidence in the company's dependability and professionalism. Above all, from our first contact, we were impressed with the high degree of attention to providing outstanding customer service. Andrew, the System Design Specialist, was friendly and thorough. We understood exactly what we were getting. The installation team were friendly, professional and very conscientious. The team worked well and left everything clean, sealed and pitched properly. From our first contact with Quality 1st we were impressed with the high degree of attention to providing outstanding customer service. Very Satisfied! I chose Quality 1st because of the price, the professionalism and the technique. The team was very nice and accomodating. Liked your process to fix slabs. Very satisfied with the job and installation team was very good. I was very satisfied with the work I had done. I was thinking about getting this job done for 2 months before moving forward with Quality 1st. I felt Andy was very informative and he never pressured me at all during the estimate or afterwards. I hired this company because other companies wanted to break up, remove and replace the concrete at a higher price. Quality 1st lifted the concrete slabs with foam. Andrew has been involved in home improvement since high school, working with his father and brother to remodel their home and cabins in upstate New York. He has worked installing pools and volunteered to help victims of Hurricane Sandy rebuild their homes. Andrew also has over 25 years of experience in International Sales. He has degrees in Business and Applied Sciences graduating from Minot State University. He has good understanding of the importance of providing a thorough inspection to make sure all of the homeowners’ concerns are addressed. He enjoys helping homeowners keep their homes safe. In his spare time, Andrew goes golfing, fishing, and helps his children work on their homes. He loves spending time with his granddaughter, Riley. A homeowner from Woolwich Township, NJ contacted Quality 1st Basements after noticing their front porch had settled a few inches. Our Concrete Repair Specialist, Andy, recommended PolyLevel would raise the porch back towards its original position all while permanently stabilizing it to prevent future sinking and settling. A customer in Washington Township, NJ contacted Quality 1st Basements for a solution to their sinking concrete driveway. Quality 1st used Polyurethane foam known as PolyLevel to fill the void below each of the slabs, raising them back to level. Polylevel is a state- of- the- art approach to repairing sinking concrete. Rather then injecting mud or cement under the slab, we inject high- density, lightweight, structural- grade polymers to lift, level and stabilize. Once the driveway was raised, the team sealed the joints with NexusPro joint sealant to prevent cracking and crumbling in the future. Our Concrete Repair Specialist, Andy recommended PolyLevel to lift and level this sinking apron in front of the garage. We drilled small penny-size holes into the concrete slab and injected PolyLevel underneath to raise the slab back to level. PolyLevel is environmentally friendly and waterproof so it wont wash away or cause future settling. 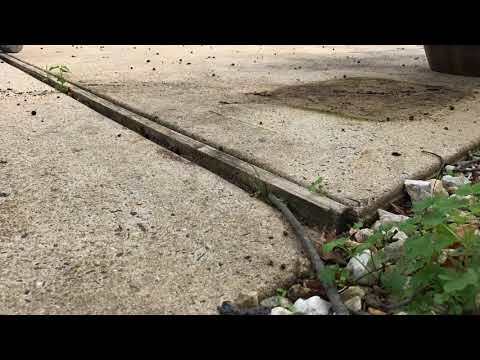 Due to the conditions of the soil underneath this walkway in Cherry Hill, the concrete sank over time and created gaps and cracks in the slabs. Our PolyLevel foreman Arturo and his team did a full walk through in preparation for the installation to make sure everything was out of the way for a success injection of PolyLevel. Once the slabs were raised and leveled, the team sealed the cracks with a joint sealant to protect the concrete against erosion, harsh weather conditions and sun exposure. The concrete walkway is now leveled, crack-free and completely safe to walk on. Check out this amazing before and after of this Patio! Before PolyLevel, this slab was settling about 1.5 inches. After our team injected PolyLevel beneath the slab, it was raised back to level and is now permanently stabilized. The soil beneath this homeowner's patio was eroded and caused the concrete to sink and settle, creating a void between the home and the patio surface. Our team was able to lift the patio back to its original position and seal the gap with PolyLevel. To improve the safety of their property, this homeowner contacted Quality 1st to lift and level their sinking concrete. Our PolyLevel team raised the concrete by injecting polyurethane foam into penny sized holes drilled into the slab. Once the concrete was leveled, the joints were sealed and the installation was complete. The sidewalk is now trip hazard free and safe for the homeowner and those coming to visit their home. Check out this PolyLevel project we completed in Linwood, NJ! The concrete area surrounding the pool was experiencing three and a half inches of settlement. By injecting polyurethane formula beneath the concrete slabs, our team was able to fill the voids and lifting and leveling the slab back to its original position. Additionally, our team applied a joint sealant to keep water from weakening the soil beneath the concrete. This homeowner had a concrete slab in their backyard that was beginning to crack. In order to keep the concrete from shifting, our polylevel team sealed the cracks with NexusPro Joint Sealant. NexusPro is a silicone-based sealant for joints and cracks specially engineered to provide long-lasting flexibility and to stand up to harsh weather conditions. Unlike traditional polyurethane sealants, NexusPro resists UV rays, which means it won't crack, bubble or dry. A homeowner in Brown Mills, NJ, had sinking concrete slabs on their driveway and wanted to get rid of the potential trip hazard. After booking their free estimate, Quality 1st arrived on time and lifted and level the concrete slabs to it's original position. The Polylevel team drilled penny size holes into the concrete slab and pumped the perfect amount of polyurethane foam to lift it. The team then filled Nexus Pro into the cracks of the concrete slab. Our team lays sand over the joint seal to stain the color so that it blends into the concrete. The homeowner was glad his driveway was lifted and leveled permanently. A homeowner in Flemington, New Jersey had sinking concrete about 2 inches on the sidewalk in front of their home and contacted Quality 1st for a free estimate. Our System Design Specialist inspected the sidewalk and recommended that PolyLevel be installed to raise the concrete. PolyLevel is a polyurethane foam that is injected into the concrete through penny-size holes. The foam begins expanding within minutes and starts to raise the concrete. PolyLevel is a fast and permanent solution for sinking and settling concrete slabs. A homeowner in Hampton, New Jersey had sinking and cracked concrete near the side of their home and contacted Quality 1st for a solution. Quality 1st System Design Specialist inspected the concrete and had PolyLevel installed to raise the concrete back to the original position. PolyLevel is a polyurethane foam that is injected into the concrete through penny-size holes. The foam begins expanding within minutes and the homeowners are able to use their sidewalk that very same day! PolyLevel is a fast and permanent solution for concrete lifting and leveling. A pool patio in West Windsor Township, New Jersey had sunk about 2 inches. The homeowners reached out to Quality 1st for a solution. Our team used PolyLevel, a polyurethane foam to raise the concrete. PolyLevel is injected into the concrete by penny-sized holes. The foam begins to expand and raise the concrete back to its original position. PolyLevel is a great solution for sunken concrete because it is environmentally safe, quick, and a permanent solution. Now that this patio is raised, the homeowners can enjoy their beautiful pool during the warmer months. A Building Manager in Stafford Township had an outdoor kitchen where the concrete slabs had crack and had settled about an inch. Looking for a company to help solve their problem, the Building Manager contacted Quality 1st Basements. Systems Design Specialist, Jeffrey Pitek, gave a free estimate of the outdoor kitchen and recommended PolyLevel to raise the concrete slabs and fill the cracks. The Project Manager and his team injected the PolyLevel into the concrete slabs raising them and filling the cracks. A homeowner called Quality 1st Basements with concerns about their sinking pool deck. Due to the excessive amounts of water seeping beneath the concrete from splashing in the pool, the soil was eroding. Our team was able to lift and level the concrete using PolyLevel to remove trip hazards. PolyLevel is waterproof and will not erode over time, but dirt is not. Our team sealed off the joints around the pool with NexusPro to keep water out to protect the soil from future erosion. The soil beneath this garage floor could no longer withstand the weight of the cars parked in the garage. The concrete slab floor was beginning to crack and was unlevel, causing the settlement to become a safety hazard to the owner. After searching for a solution to fix their concrete, the homeowner came across Quality 1st Basements PolyLevel System. After meeting with our concrete repair specialist Andy, the homeowner felt he was in good hands and therefore decided to go through with the installation. Our PolyLevel crew injected the polyurethane foam beneath the slab of the concrete to fill the void. Once the slab was lifted, they sealed all the cracks in the concrete with NexusPro joint sealant. The garage floor is now completely level and safe again. A homeowner from Jackson, NJ was experiencing sinking slabs on the front walkway of their home. The slabs created multiple tripping hazards. Fortunately, the homeowner had received a Valpak coupon in the mail and decided to contact Quality 1st Basement Systems. System Design Specialist, Andrew Gagliardi , inspected the homeowner's front yard and suggested PolyLevel. Primary Foreman, Arturo Jacuinde and his crew injected PolyLevel foam under the concrete slabs, quickly raising and elevating each one. The homeowner was amazed at how quickly Quality 1st Basement Systems was able to provide a solution. An uneven pool deck can be a huge safety hazard in the summertime. Luckily, our PolyLevel team was able to lift this sinking slab of concrete and eliminate the tripping hazard for the homeowner by injecting a polyurethane formula beneath the slab. The formula is lightweight, environmentally friendly, and waterproof. The homeowner in this Monroe Township, NJ home had problem with their driveway which had 2 inches of settlement. The homeowners contacted the experts at Quality 1st Basement Systems about their concrete lifting and leveling system known as PolyLevel. PolyLevel is the perfect solution for concrete problems, since it is less expensive than replacing each slab and the process is quick, easy and causes minimal disruption to the surrounding area. Within 15 minutes of completion, the homeowners were able to park their cars back into the driveway. A homeowner living in Monroe Township contacted Quality 1st Basement Systems to have someone come out and inspect the concrete concerns they had for their backyard patio. The patio area around their pool had settled around an inch. With the help of System Design Specialist, Andrew Gagliardi and our team, each patio slab was raised and leveled using PolyLevel. The homeowner was amazed at how the PolyLevel injection lifted each settled slab back to its original state. A homeowner in Toms River, New Jersey had sinking concrete outside of their garage. The homeowners contacted Quality 1st for a FREE estimate. Our specialist inspected the settlement and had PolyLevel, a polyurethane foam be installed to lift the concrete back to its original position. The PolyLevel is injected into the concrete through penny size holes and begins to expand and lift the concrete within minutes. The homeowners do not have to worry about an uneven driveway anymore. The concrete in the garage of a Hackettstown, NJ home was settling impacting the homeowners peace of mind that there could be further settlement. Our PolyLevel team was able to raise the two collapsing slabs back to their original poistion by injecting PolyLevel Foam underneath the slabs. The pool patio of this Spotswood, NJ home was sinking and settling, creating a tripping hazard for the entire family. The homeowner was interested in Quality 1st concrete lifting and leveling and gave the company a call. System Design Specialist, Andrew Gagliardi, went out to the home to measure the sinking concrete. The concrete slabs had sunken in 4 inches around the pool stairs and 5 inches around the far end of the pool. Project Manager, Arturo Jacuinde. and his crew were able to lift and level the entire pool patio area with PolyLevel Polymer Injection. 15 minutes after the crew was done, the family was able to use their pool.